prayer wheels, originally uploaded by nobodaddy69. Thank you for your pictures of Mongolia. I thought they were great. I'd grown tired of shots of Nigeria (unappealing urban landscapes)(until your last foray into Plateau state - it seems very beautiful and the sentiment of appreciation expressed by yourself and Teju was refreshing. Hardly do we see a Nigerian talking about how beautiful a relatively unspoiled environment. Though you could have told the woodcutter. If for no other reason, he should consider replanting two trees for everyone he cuts down, to avoid his home from becoming a dusty wasteland like parts of the nearby Borno state). Back to Mongolia, it looked spacious, airey, uncluttered and clean (compared to Nigeria). 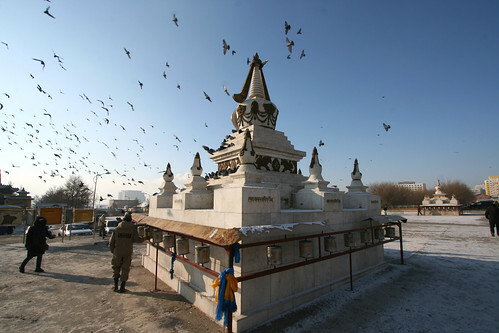 The panorama of Manzushir near Ulaan Baator, the picture of the prayer wheels, the Bhuddhist heritage. All point to a very old and cultivated civilisation. Even contemporary Ulaan Baator, seems clean and ordered. I can only imagine that the Fulani and other nomadic peoples of Nigeria would be envious of the nomads of Mongolia, for having so much free space to roam and live their lifestyles. How did you come to choose Mongolia? Did you spin a globe and randomly stop it with your thumb? Thanks for publishing those pictures. They were great. What I liked about it, was that it was so different and beautiful at the same time.